A front-loading gas dryer outfitted with a large, reversible door and plastic control panel with a blue LCD display. The programs include SteamFresh and SteamSanitary, as well as the EasyIron and ReduceStatic options. Its humidity sensor called the Sensor Dry system regulates temperature and drying time according to your clothesí needs. A program called SteamSanitary disinfects non-washable items such as decorative pillows and toys, while the SteamFresh cycle refreshes your clothes in a 20-minute cycle. Basic programs like Normal, Heavy Duty and Ultra Delicates are joined with options like ReduceStatic and EasyIron. Airflow and lint buildup are monitored by the FlowSense Indicator, whereas the Sensor Dry System makes necessary adjustments in temperature depending on the drumís moisture content. The extra-large 7.3 cubic feet NeveRust Stainless Steel drum is equipped with a drying rack for non-tumble-dry pieces like stuffed animals. The cycleís status and remaining time are displayed on the blue LCD screen. Dials and controls have English, French and Spanish labels. This electronic control panel sits right on top of the dryerís door. The unitís reversible door is made of clear glass with chrome frame. Its cabinet is made of painted steel, while the top plate is molded porcelain. Available colors are White and Navy Blue. Adjustable leveling legs come with the dryer. Or choose to place the unit on top of a matching washer with the optional stacking kit. A 13 3/5î high drawer pedestal is also available. Both stacking kit and pedestal are sold separately. It has 9 programs and 10 options. The EasyIron option helps minimize ironing time. Non-washable items are cleaned and disinfected with the use of SteamSanitary program. Static cling on clothes is trimmed down by the ReduceStatic option. SteamFresh is used to minimize wrinkles and odors. Bacteria on clothes are killed by the dryerís Antibacterial system. The FlowSense Technology tells you when it is time to clean the dryerís air ducts. Temperature and drying time are automatically adjusted by the unitís Sensor Dry system. The electronic control panel comes with Dial-A-Cycle and a blue LCD display. Its extra-large NeveRust stainless steel drum is fitted with a drying rack for drying shoes and stuffed animals. Optional stacking kit and pedestal are available. 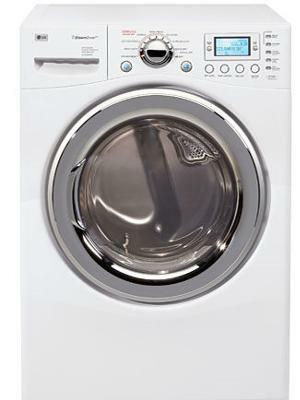 Compared to dryers with the same features, this model costs a lot higher. Takes longer drying time than the manufacturer promised. Although the unit is warranted for 1 year, not all areas have LG service centers.